Students and staff from Red Rock Job Corps in Lopez, Sullivan County, traveled to the state Capitol Monday as part of the Youth 2 Youth: Partners 4 Peace program, which Job Corps students launched last spring to proactively prevent youth violence. Rep. Tina Pickett sponsored House Resolution 982 designating this week – Sept. 19-25, 2016 – as “Youth 2 Youth: Partners 4 Peace Week” in Pennsylvania. 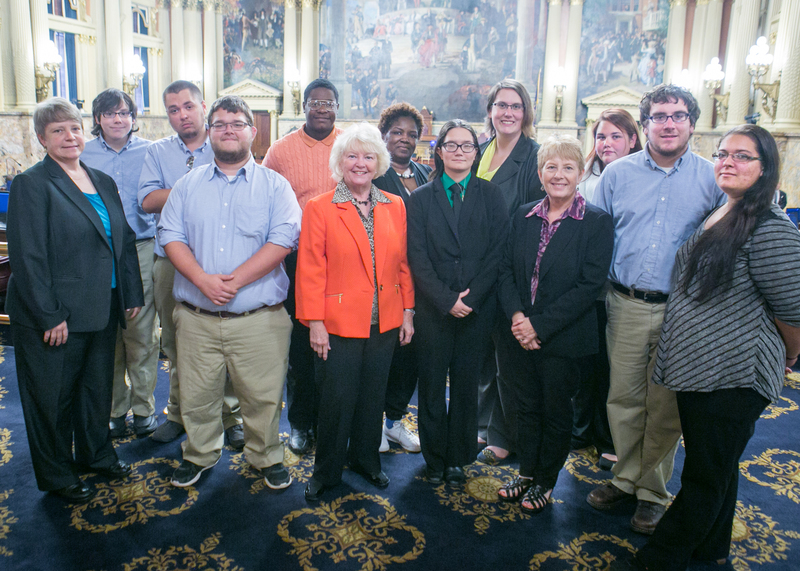 HARRISBURG – To recognize Sept. 19-25, 2016, as “Youth 2 Youth: Partners 4 Peace Week” in Pennsylvania, Rep. Tina Pickett (R-Bradford/Sullivan/Susquehanna) welcomed members of the Red Rock Job Corps from Sullivan County to the state House today. The Job Corps members were in the House chamber when the proposal calling for the date designation, House Resolution 982, was unanimously voted on the House floor. “Red Rock Job Corps students are using the Youth 2 Youth: Partners 4 Peace program to expand the conversation about violence and talk about how this violence is impacting their peers and their communities – all with the hope of getting people their ages to put down the guns, talk about their differences and improve their communities,” Pickett told her House colleagues during remarks delivered after the resolution’s vote. Last spring, Job Corp launched a violence prevention initiative with four main goals, including talking openly about violence, aggression and bullying; learning how peers have been affected by youth violence; empowering one another to make a difference; and exploring solutions for the future. To view Pickett’s remarks on the House floor, click here to access the YouTube link here. Since 1964, the U.S. Department of Labor’s Job Corps program has helped provide hands-on technical training and education for students ages 16-24. The program operates four centers to train and educate lower-income youth in Sullivan, Luzerne, Allegheny and Philadelphia counties. “I believe this new initiative is one more way in which our youth can make a positive difference in our communities, and I am proud to have sponsored this resolution designating this week in honor of this terrific program,” Pickett said.